Boomerang Love?? Borderline Personality Disorder?? Living in a Dr. Jekyll and Mr. Hyde relationship can be very confusing, until we learn about Borderline Personality Disorder. I wrote my book Boomerang Love as I crawled out of my own pain with a Borderline partner. 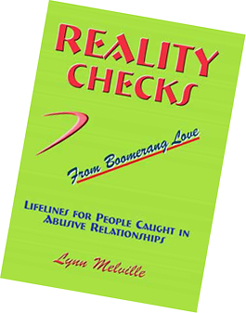 Boomerang Love describes the on-again, off-again behavior some of us have engaged in with our love relationships. We leave the painful relationship ... then go back to it ... then leave it ... then go back to it ... over ... and over ... and over. 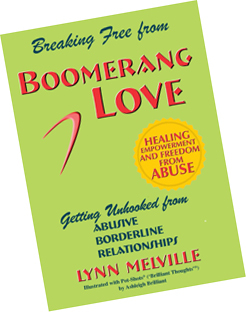 Through the daily readings and affirmations in Boomerang Love, you’ll be led into an inspirational, experiential journey as seen through the eyes of a partner to someone suffering with Borderline Personality Disorder.  Boomerang Love progresses from the silent withdrawals to the exploding rages of the Borderline - from the fearful, walking - on - eggshells behavior to the ultimate healing and empowerment of the partner. 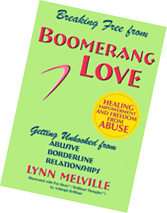 Boomerang Love describes how the partner of the Borderline repeatedly leaves the relationship, only to return to it again and again, desperately trying to fix an illness of which they don't even know the name - and which only the Borderline can fix, with professional mental health help. The object of Boomerang Love is to help you reconnect with yourself - who you are and what you're feeling in the relationship you're in. Our feelings are what lead us to the actions we need to take. Order Both Print Books and Save $5! How Did This Happen? How Did My Sweet Love Relationship Get So Bad? The Tin Man: An Unbreakable Heart? Will We Ever Really Be Safe? possible presence of Borderline Personality Disorder.